Am starting a new & on-going thread, in the style of many of you to encompass future projects - rather than have a different one for each model. Don't know if the moderators want to merge the Railbus into this, but happy to let it stand alone, as still want to add a couple more pictures. First up in the new thread is the ticklish subject of signals. Well, ticklish to me that is & this is putting it mildly. I confess to an innate issue in putting together anything that is 'handed' [flatpacks a nightmare], so with the signal in question having 3 arms on two dolls, with an arse-about-face additional problem of operational bits being upside down underneath the baseboard surface. Simple structure, but a nightmare to make work. 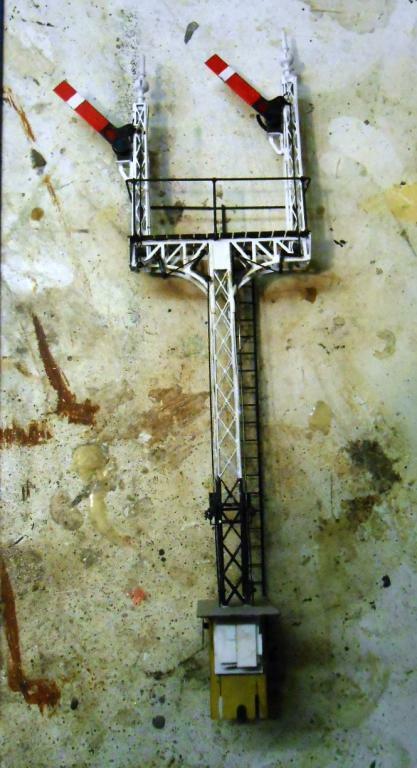 The pictures show firstly 'one I made earlier' - an LNER lattice post two doll starter, built using Wizard Models components about which I cannot speak too highly. 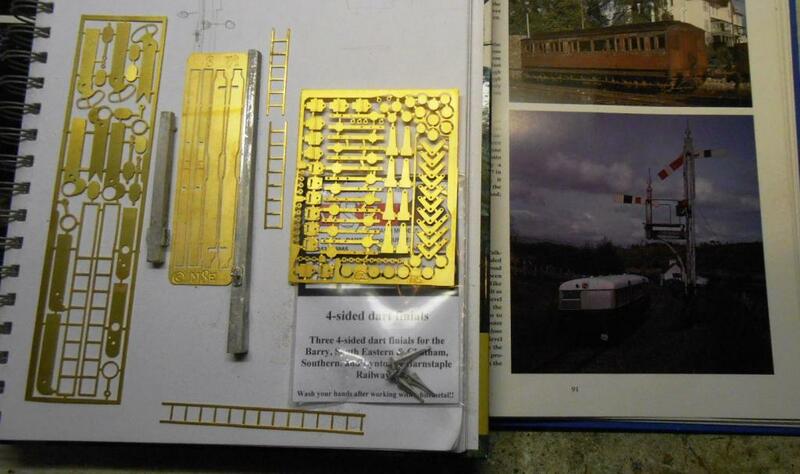 The second picture shows the bits I am using to build this model, alongside a picture of the prototype. The final one is progress thus far. The two whitemetal main posts have been connected with laminated 60x250 thous plastic strip, then pinned and expoxied together. 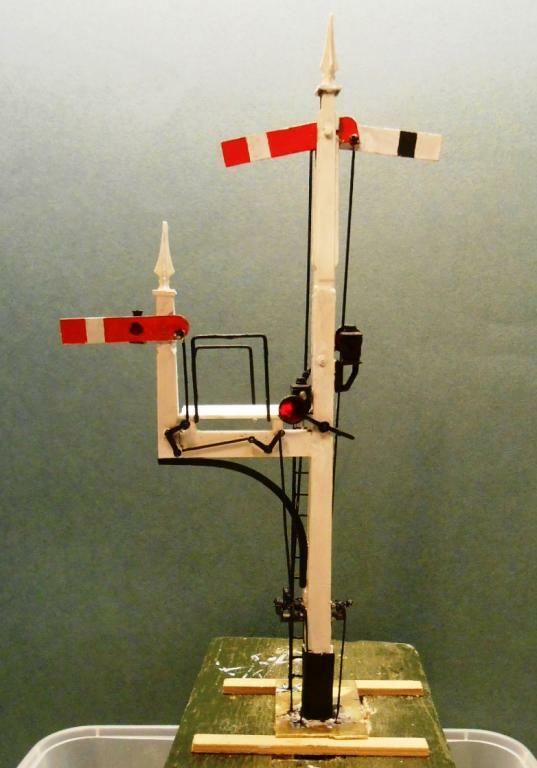 A Wizard Models slotted post kit caters for the two arm main post, with all three arms coming from the Tyrconnel Models etch available from Alphagraphix. The arms need to be painted before being fixed in place. This only took a couple of hours, but then linking the operating rods [0.7mm wire] to the balance weights and then below the baseplate to the operating mechanism took the whole weekend, amid much cussing and swearing. Signal operation is a peculiar science which I often think is akin to iceberg theory in that 90% of the model is below the surface. 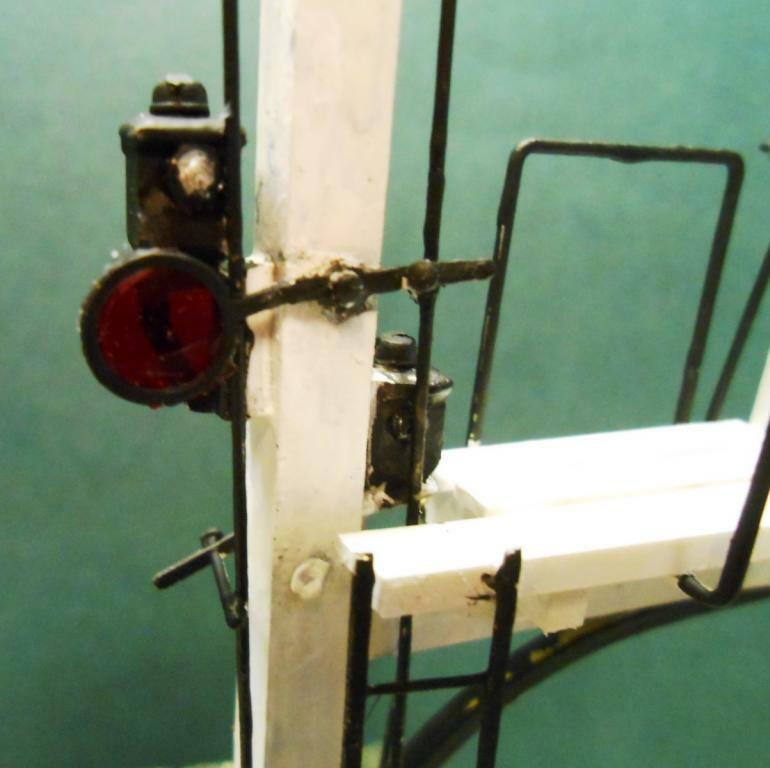 The Wizard models idea works on a wire in tube format that allows the whole signal to be removed from the baseboard for transport an maintenance. L shaped 'paddles' pivot to give the up & down movement to the balance weights. This part seems to be working ok, but will be some time before I can install it on the layout as the baseboard needs a hole cut and the operating links fitted to the underside. A few more stress filled hours have got the signal finished, though not yet mounted. As the pictures show, have added the finials, decking and the lamps. The latter and interesting exercise as I wanted to replicate the working lenses. The Sligo tended to go for a red light for danger and a clear white light when the signal was pulled off. They also had the lamps remote from the signal arm in many cases, so have done that with the two slotted ones. There are some lenses on the Tyrconnel fret, so used these, pivoted with small pins on the main post. Soldered a small extension to the pivot arm, with another pin fitted into a hole drilled into this. This pin is soldered to the operating wire to the signal arm, enabling the lens to swing down from the lamp. Sadly the lamps do not work. My knowledge of electrics would fit on the back of a postage stamp with room to spare and the though of wiring up an already busy signal post fills me with horror! Also included a photo of the below baseboard bits, though not sure if it is of much use. Just hope the things work when I fit them. No reason why not, but space is a bit tight to say the least. 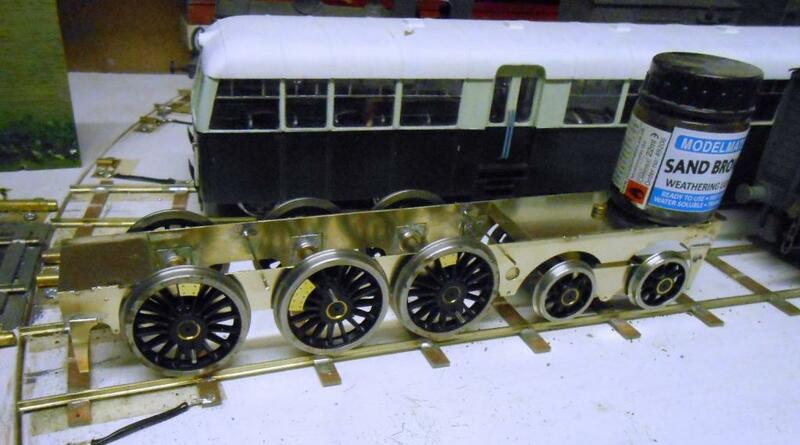 Railbus B certainly felt like a major project, not least because it was a scratchbuild, but there is something rather splendid about starting a model locomotive kit. As with Hazlewood, this is a Northstar Kit, which our own Weshty is now custodian. Have spent several sessions reminding myself of the kit and getting serious arm ache with the rivet press. However, now ready to get started, so should be able to report on the chassis by the weekend. Don't know about anyone else, but the successful completion of a working chassis is always a cause for celebration for me. I've built over 50 locos [kits and scratch] in the last 20 years, so I ought to know what I'm doing by now, but it is always so nice to get a chassis to the point where wheels and coupling rods turn freely. After all, we want our trains to run well. 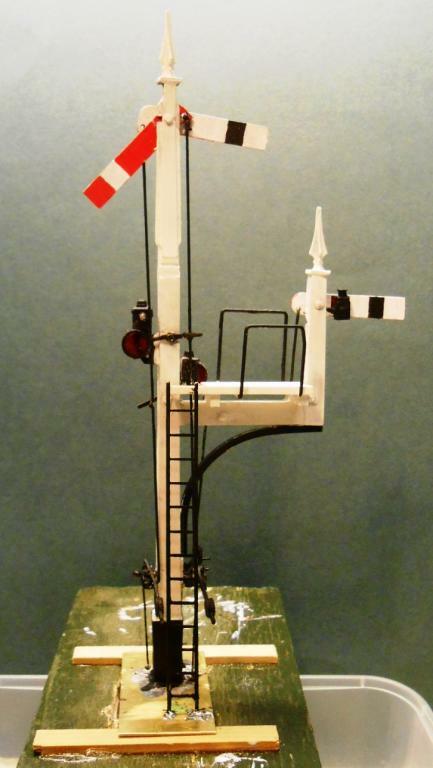 The Northstar [now Studio Scale Models] kit is fairly simple in that it is a basic six coupled unit, with no outside rods or valve gear to worry about. There are nice slots and tabs to help align things, so with my aluminium rods, it wasn't too hard to get everything nice and square, so the chassis will roll under its own weight. 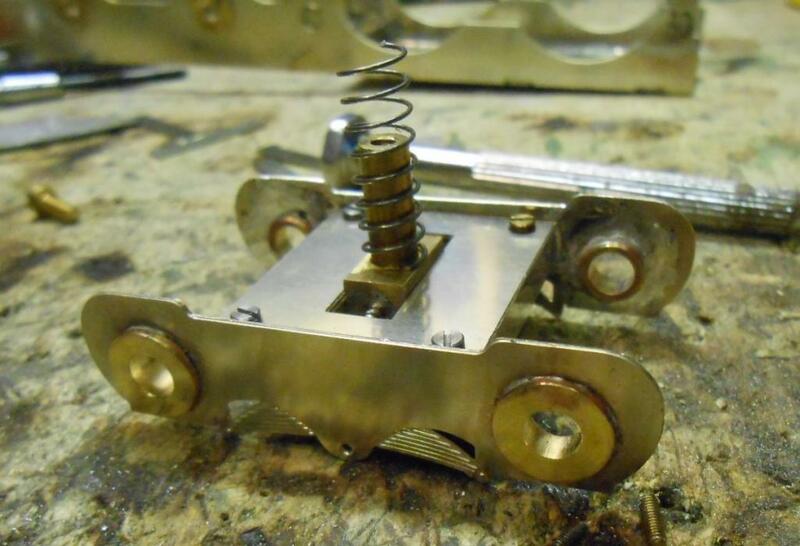 The interesting bit is the trailing bogie, which has a clever vertical and horizontal alignment capability using small and large springs and a sliding machined brass block. Works well. Springs and brake gear are a bit fiddly, but again, careful design and clear instructions ensured things went together easily. The final bit of the chassis was to add some dummy inside motion. This is a crude copy of a very nice set of castings produced by Laurie Griffin. In my case cobbled together from plastic rod, strip and tube. Once painted, it fills the large gap between the frames - often an issue with Irish locos. When I do Large Tank Sir Henry, I've promise myself that I will have a go a working inside motion - the wider frames ought to make it a bit easier, but like outside motion, is one of challenges I think one has to have a go at eventually. You can hold me to that too. 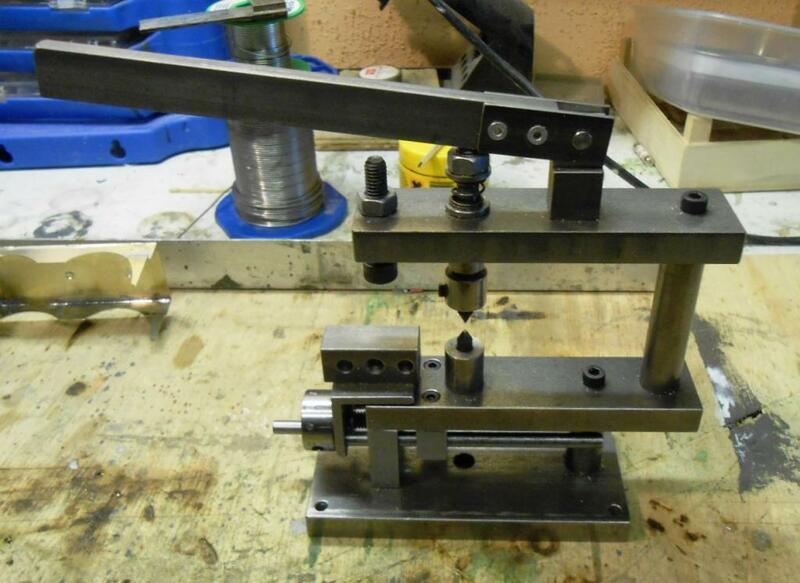 Have included a picture of the GW models Rivet Press - super bit of kit, essential for this model, as you will see later. Exquisite Work, Chassis looks Amazing. Tuning in to this one big time!! the Valve gear is the job. Superb stuff as always David. How much is the rivet press? Have a look at this link;- http://www.metalsmith.co.uk/rivet-embossing-tool.htm . I have one of these and they are in the £65.00 range, it works brilliantly. Murrayec is correct, Warbonnet. Currently the press retails for £85... Did I really pay that much?!? Works with material up to 20thou thick. Has 3 anvils and two punches. Plus if you are suitably minded, there is a table gizmo with adjustment wheels [like on a lathe?] which, if you follow the instructions & understand the maths, enables evenly spaced rivets to be produced - even in a circle. I use mine intermittently, but is one of those tools that, once you've invested, you wonder how you got on without it. Bit like a static grass machine. Cheers for the info guys. Did you pay much in postage Eoin? Would imagine it would be heavy enough? I got a 4mm rolling bar set from gw models. Total old school. And total class, really does the job. I will be treating myself to the riveting machine in the future, particularly as it enables almost automatic placement (RTFM vital of course). Thanks for the photos and help David, very much appreciated, as always. This is modelling on a different level, I look in awe. 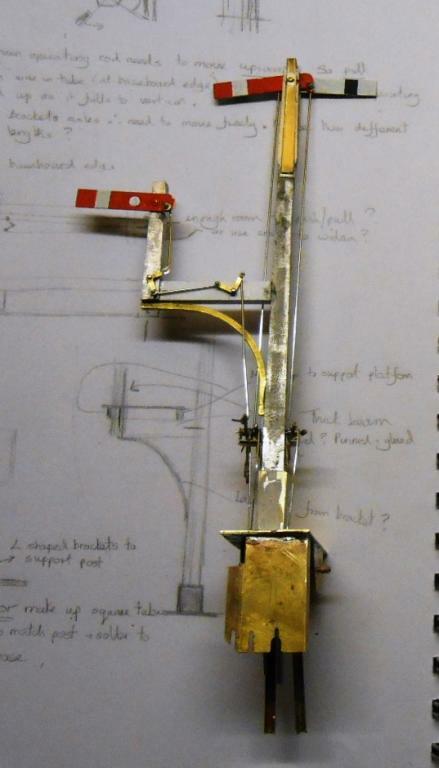 Great work David by the way, I love little devices with nuts, bolts, springs n things- real model engineering. That's pretty reasonable in fairness. Cheers Eoin. Now all I need is somewhere to put all this and to work as well as some nice citizen to show me how to solder brass kits together properly and I'll be laughing! After the delights of a week in the sunshine [Tenerife, very nice - especially away from the resorts], got back to model making. The kit is so well thought out that assembly is a breeze for all the main structural bits. 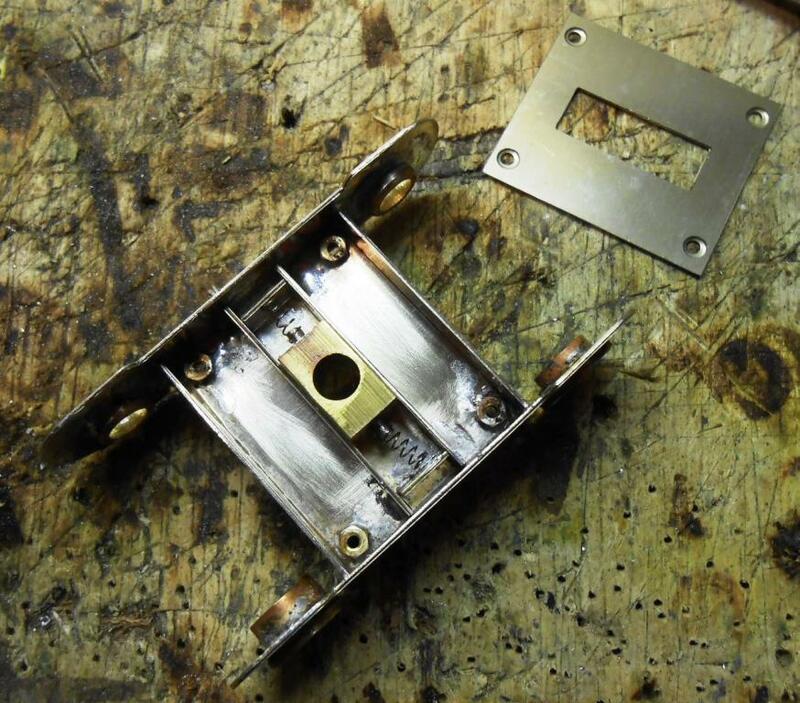 Tabs and slots make positioning of each piece easy, particularly once all the rivets have been pressed out. The boiler requires a bit more effort as it needs rolling. On Hazlewood, I used some large diameter copper pipe that our plumber gave me. Absolutely the right size, but such a heat sink that it was impossible to solder anything to it. This time, borrowed a blow torch and annealed the boiler etch, which made rolling a tube much easier. A picture shows the 'tools' used - essentially some plastic water pipe and a bit of curtain pole, though anything of the suitable diameter will work. Used florists wire [soft iron], twisted round the boiler to hold in shape while the end pieces were soldered in place. After, a chunk needed taking out [with a slitting disc] for the motor gearbox at the firebox end. Setting up the boiler on the footplate has been well thought out. 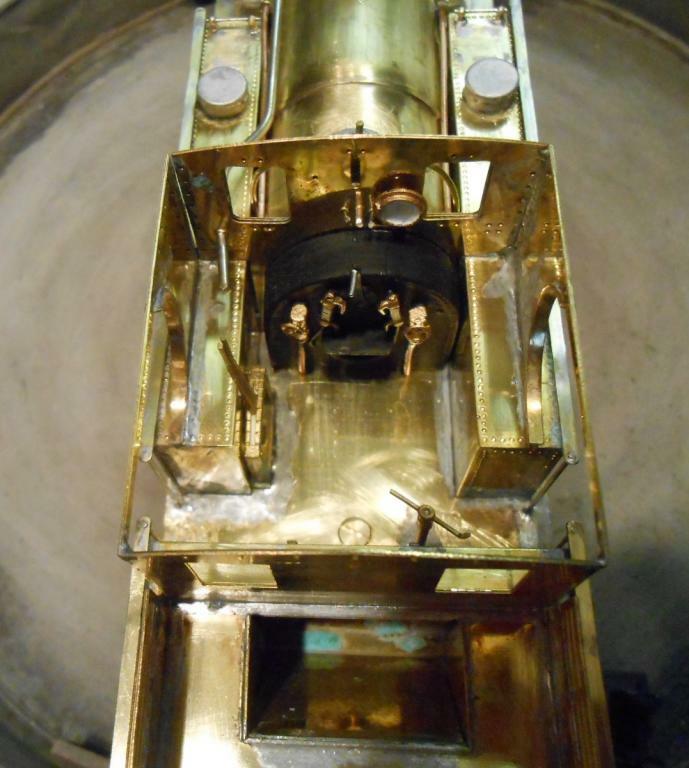 One solders a nut in the centre of the firebox end and then this can be bolted in place via a hole in the cab. 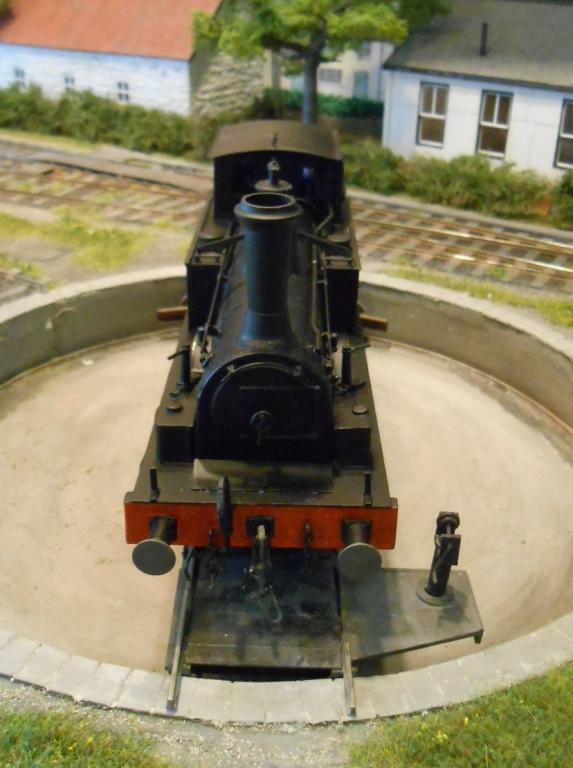 A self tapping screw is used to hold the smokebox front in place & once satisfied all is square, the smokebox front is tack soldered to the boiler. 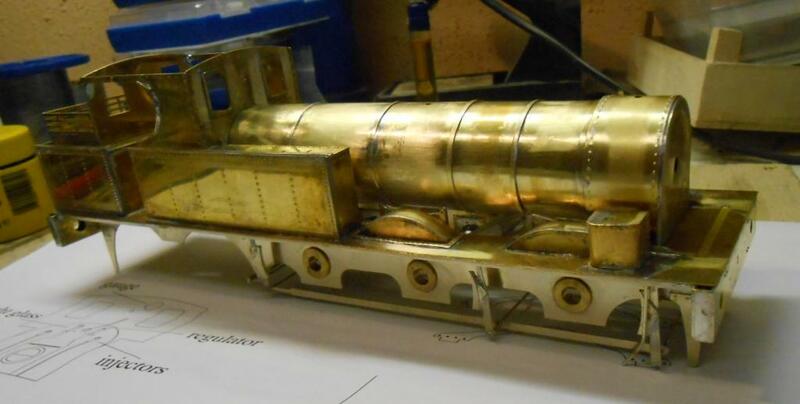 One addition I've made is to solder a nut to the inside of the smokebox, so the whole boiler-smokebox unit can be bolted in place, which will hopefully make painting a bit easier. So suddenly the main structure of the loco is complete. However, time-wise, I suspect we are less than halfway still. This is because adding the details takes a lot of effort, while cleaning up, painting & weathering is also something not to be hurried. Getting there though. All the main parts are in place now & I am at that start of 'adding the details'. even within a class of just 5 locos, there are many differences & the decision to make this loco Fermanagh was largely based on the plain smokebox door. Hazlewood was built because there seemed to be more photos of it than the others - though still missed the new cab, which I hope to remedy shortly. 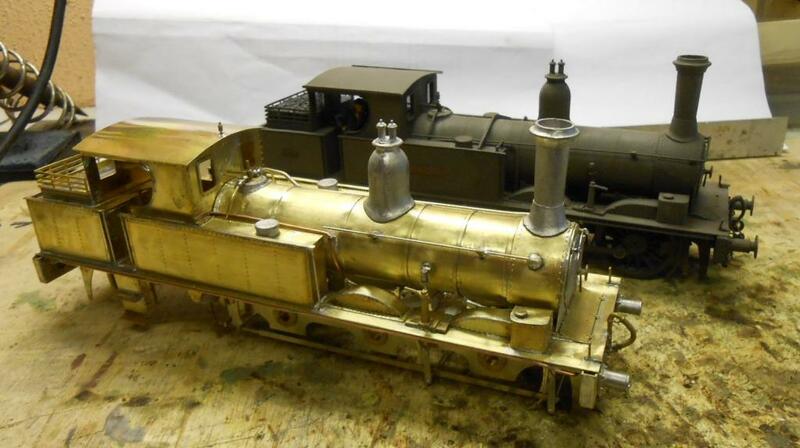 Anyway, the photo shows the two locos together. Adding up the details, I estimate there are still around 100 individual items to add [& no I'm not counting individual safety chain links]. What will probably take just as much time will be the cleaning up process. Maybe if I worked more slowly, there would be less solder to scrape off, but it is what I do and along with putting a lot of effort into getting a model ready for the paint shop, helps hide the building process in places. Brilliant stuff David, looking forward to the next installment. Mentioned last time that there were close to 100 items that still needing adding to Fermanagh, however, as most of them were only a couple of minutes each, it hasn't taken long to get them done. Had to remove the heavy strapping between the two tanks, as it gets in the way of removing the boiler unit. Hence will be glued back in place once the main painting has been done. However, buffer housings, handrails, piping etc have now been added and the backhead is ready for painting, though will not be able to fix this in place too permanently, as it covers one of the bolts that hold the boiler in place. Perhaps I could replace this bolt with a stud or brass rod, leaving just the bolt under the smokebox to hold the boiler unit in place. Any thoughts anyone? 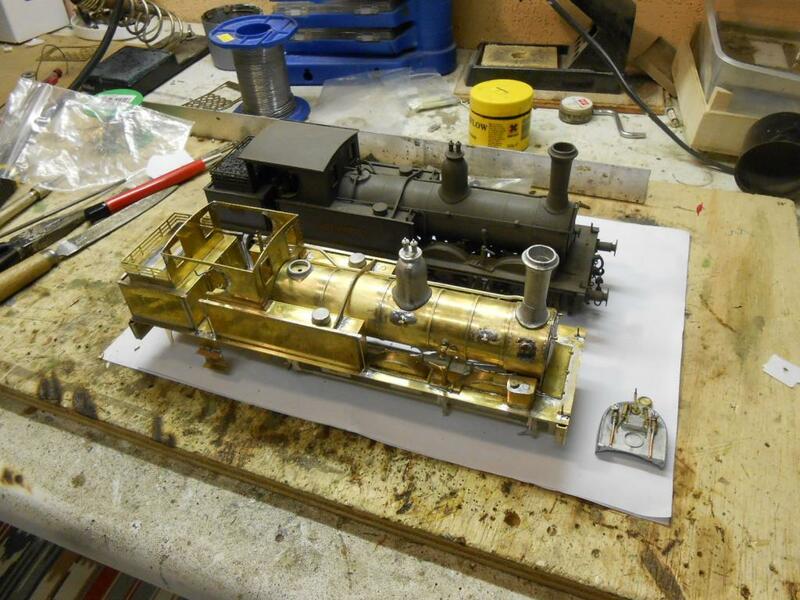 Can't do a lot more now till after next weekend, as need some fine L shaped brass for the cab roof rainstrips, plus the all important motor gear box, both of which I'll hope to get from Allypally on Saturday. 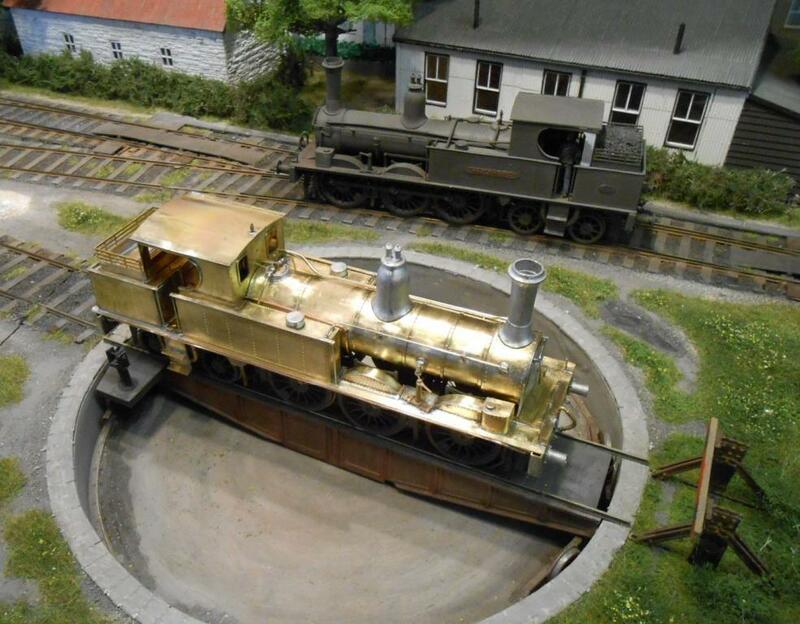 There's a certain S gauge Irish layout I want to see there too. See what differences you can spot between the two models. Absolutely stunning stuff as usual! Inspirational stuff David although the larger scales are easier to work in, detailing takes 2-3 longer than 4mm because there is so much more that can be seen/modelled. John is right, 7mm scale is easier and having started in 4mm, EM gauge, I would not want to go back. 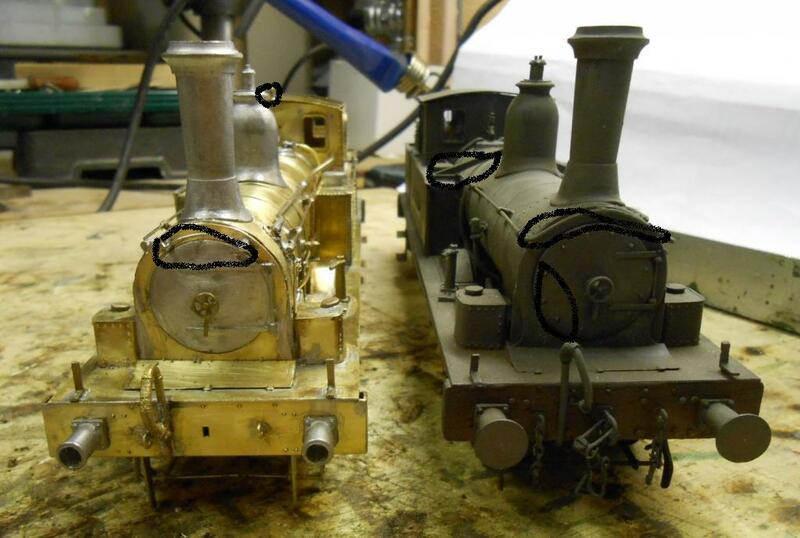 Doing Railcar B's chassis reminded me how small and fiddly it is by comparison, while I have the greatest respect for the 2mm finescale folk too, whose models always seem to run so well. Suspect if I started again now in 4mm, my locos would all be 'off the shelf', because standards now are so much better than when I started 30 years ago. 7mm scale is potentially no more expensive than 4 or 2mm, mainly because, being bigger, you need less! RTR stuff is undoubtedly wallet emptying, compared to 4mm, but if you stick to smaller prototypes then kits are quite reasonable, while the new Dapol Terrier and 08 shunter are meant to be coming in under 200 euros. 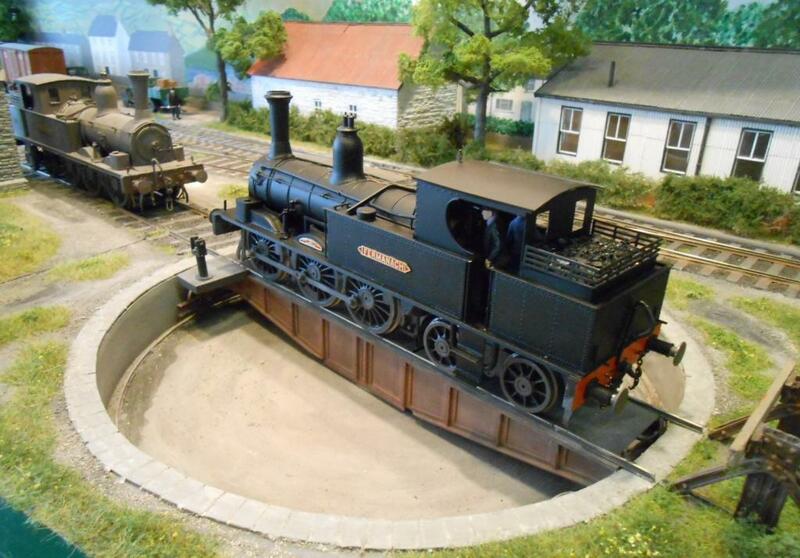 Their wagons start at about 40 euros - the same price as kits from Slaters and Parkside. Guess that 7mm is more of a builders [rather than operators] scale, because you need a lot of space for even a model station, while the 'basement empires' beloved of our cousins over the pond would need a lot of real estate in this scale. Am putting together some words for a possible IRRS article on 7mm scale and how 'doable' it is these days, especially 5'3, where it must be a lot easier than 4mm, with no need to go beyond finescale into S7. 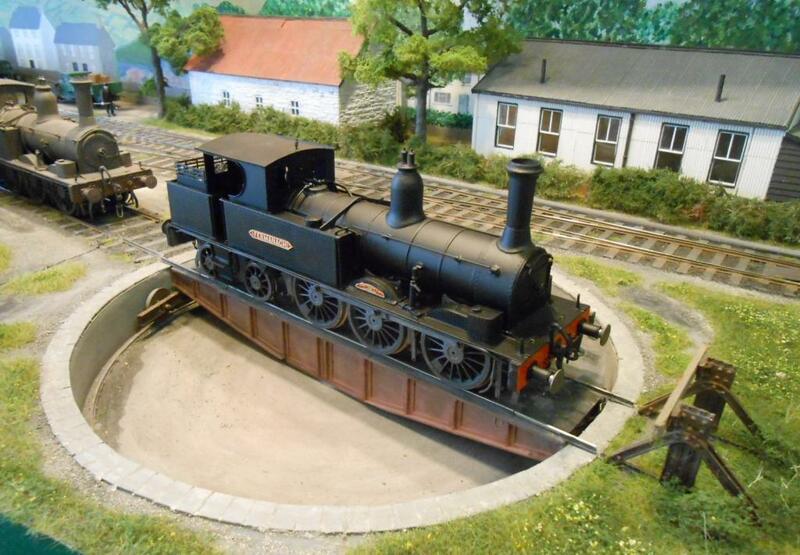 Would encourage anyone to have a go - a small diorama or shunting layout could be built quickly and reasonably cheaply. Alternatively, 7mm NG is a great way into the scale. That is how I started, with freelance locos built on commercial chassis and Ratio underframes for wagons and coaches - all in plasticard. 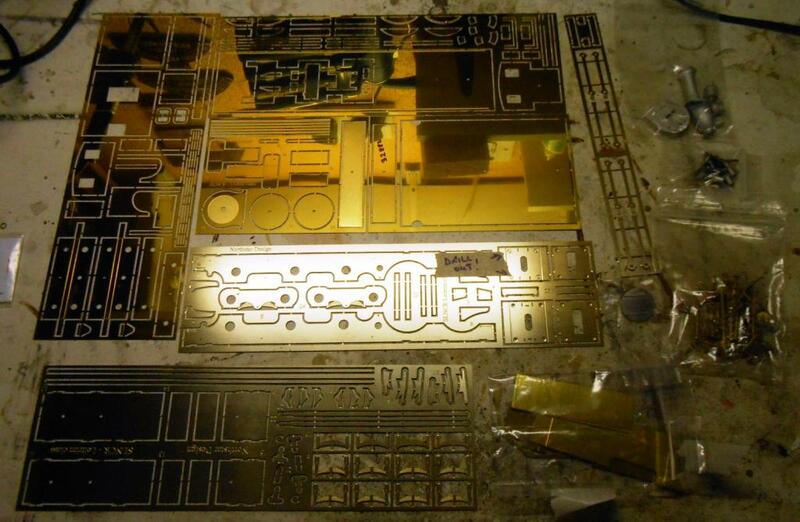 A 7mm NG layout can be built in the same space as a 4mm line and you learn a lot in the process. However, it is VERY addictive! 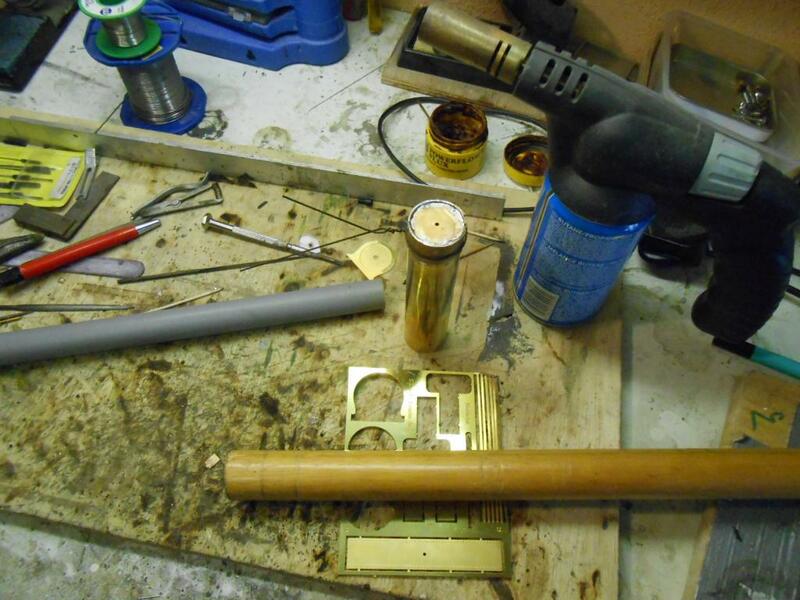 After my visit to Allypally, got the required bits and pieces to complete Fermanagh - handrail knobs, fine brass strip and the all important gearbox. Spent all day Sunday getting the loco running. Sometimes things just 'work', others it needs more effort!. No criticism of the kit mind - just one of those times when one has to persevere and a loco is little use if it doesn't run properly! 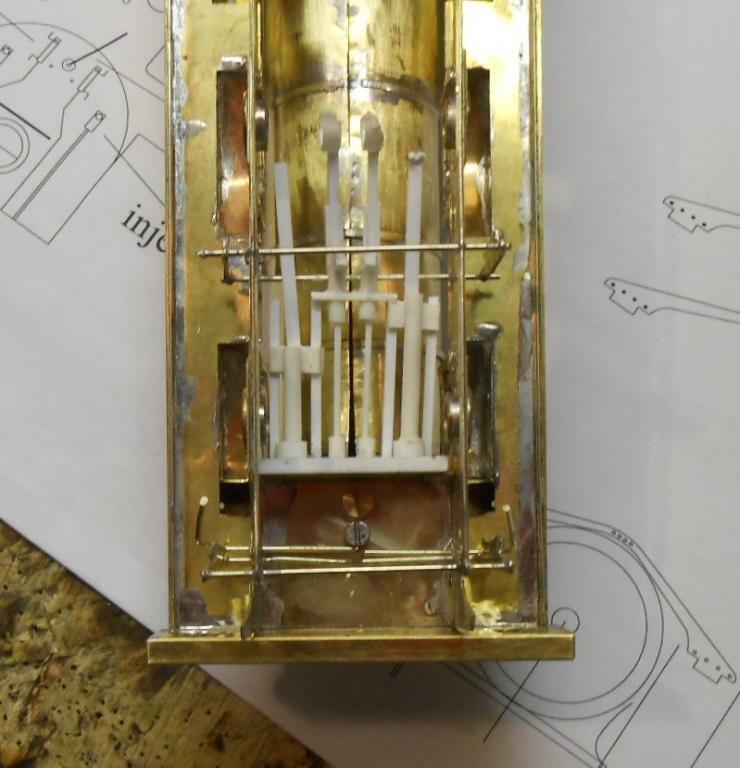 So, first had to tune the gearbox [A Roxy Mouldings etch], because the brass bearings supplied were a bit tight and the motor was running hot. Once that was cured, then installed it on one axle of the loco and checked it would fit in the body cut out. Small amount of fettling needed, but soon fine, so then hooked up the con-rods for another test. This also went well and I then had a motorised chassis which ran without the motor getting warm. However, when I fitted the bodywork, it was clear that the front drivers were rubbing on the splashers - never good on a metal kit as there plethora of sparks showed when I tried it on the track! 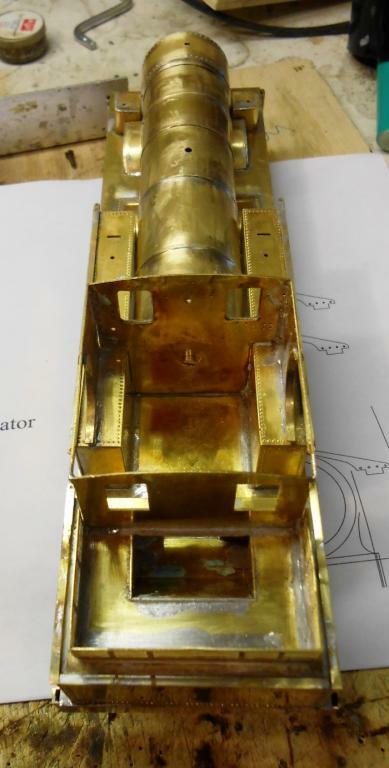 Only answer was to unsolder the front and middle splashers and open out the cut outs by a millimetre each side, before re-fitting the splasher bodies. Really a simple case of clearances being a bit tight for 36.75mm gauge - that and the fact that I should have checked them earlier. 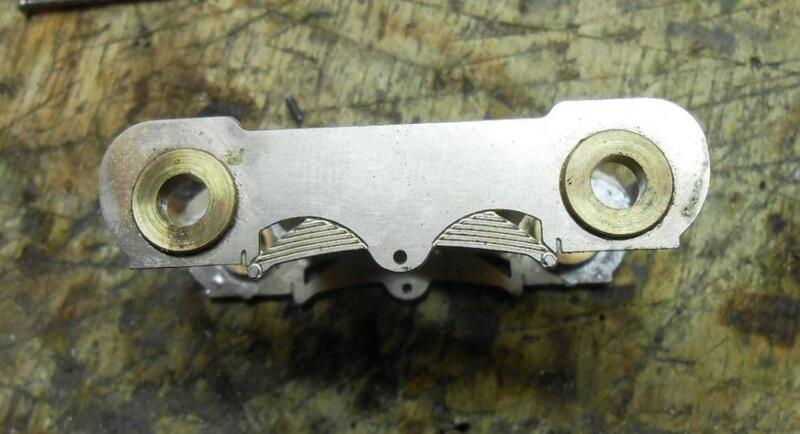 Even so, then needed to fit thicker washers to limit side play on the front drivers to an absolute minimum. Sod's Law then said the motor was running warm after 10 mins on the rolling road, so a bit of thinning required... Should now be fine for the 4 metre run that is all that is expected of the model though. All still not perfect though, as needed a couple goes at trimming the spring on the bogie, before the drivers sat properly on the track. However, it now seems to run pretty well & will continue to give it more time on the rolling road to bed things in. Now a case of adding the extra bits & pieces, such as the small handrails on the front of the tanks and the rainstrips [lips really] on the cab roof. Then painted the back head & took the model apart again, so I could do a thorough clean up, prior to priming. Will be very surprised if it doesn't need further work once this is done as primer provides a very useful 'witness coat' for the minor blemishes you miss on a gleaming brass finish. Pictures show the loco with Hazlewood - this now has its cab profile corrected and also now needs to visit the paint shop again. Also a couple of pics of the underside, showing how I've arranged the pickups. with no room to hide them behind splashers or solebars, they are fitted semi-vertically and bear on the backs of the flanges. Quite pleased with the effect, not least because my pickups normally end up very untidy & for once these are quite neat - for me especially! As I always say in these circumstances - it's almost a shame to paint it. That's a simply beautiful piece of work. 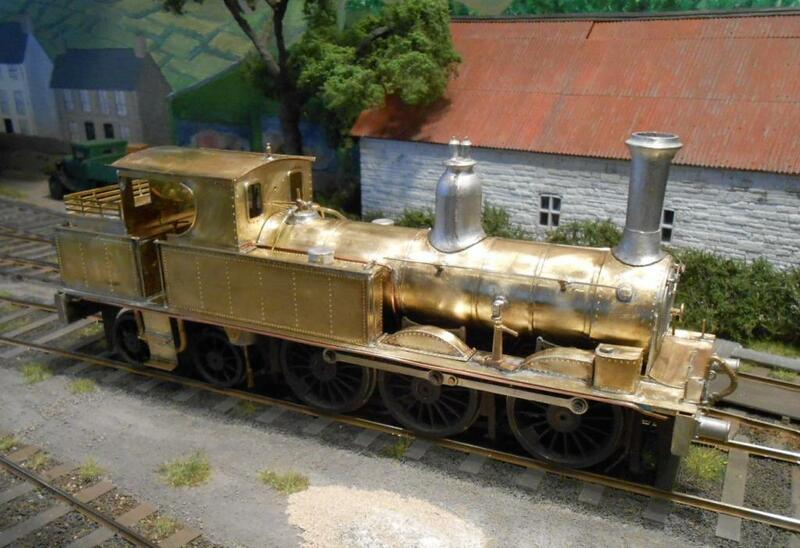 I'm constantly amazed at the skill of some modelers. Well done sir - though really only four as the strapping across the tanks will go back once the paint shop has been visited. After 54 locos, this is the first time I have built two the same, so small details count! The paint job will also be significant as aim to make Fermanagh cleaner. I concur. A beautiful piece of work. Halford's spray cans [grey primer, then matt black] were used to paint the separate boiler and tank/footplate units. Left overnight to dry, the parts were then re-united and bolted to the chassis and bogie unit. The strapping across the tanks was then added, after which the final, post painting, bits and pieces could go on including buffer heads, couplings and safety chains. The latter were probably the most fiddly part of the whole kit! The exquisite name and builders plates came with the kit and are from Guilplates. Photos show just how very black a spray of matt paint is - quite a contrast with the already weathered chassis and the work weary Hazlewood. 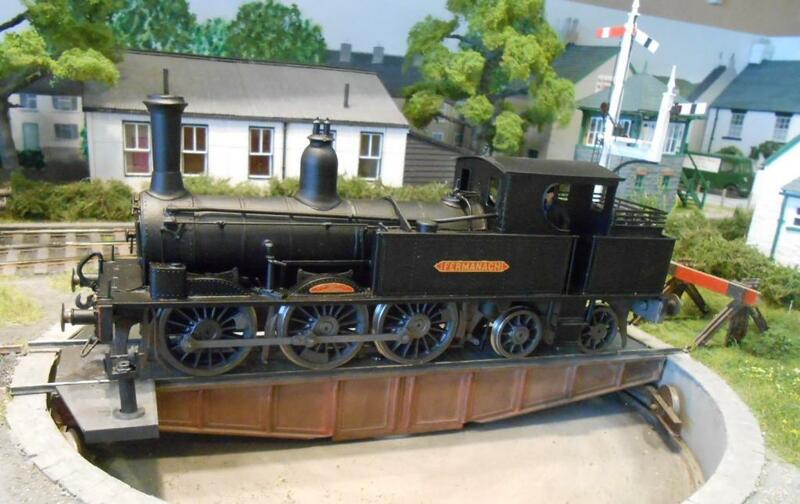 Fermanagh was withdrawn in the early 1950s, but one would hope that the existence of the Arigna branch would have prolonged its life and the model with be more lightly weathered than Hazlewood, assuming a general overhaul at some point.